This Orange Chiffon Cake is made up of three soft and fluffy layers of orange chiffon cake, which are layered with a creamy, zesty orange filling. It’s finished off with a delicate, sweet meringue that’s been toasted to golden brown perfection. This is a cake not to be forgotten! “I visit an elderly couple who are living in a nursing home here in Stillwater, OK at least once a week. Their names are Evan and Bethel [last name withheld], and they have been married for 71 years. Bethel is 92 years old, and Evan in 95. They are still so in love with each other, and they are the most precious people I have ever met! Bethel was famous for her orange chiffon cake when she was younger, and she won a blue ribbon for it at the state fair (she was very proud of this cake)! She described it to me as an orange chiffon cake with an orange frosting/filling between the layers, and the whole cake was topped with a meringue and (I think) slightly browned in the oven. While she was telling me about this cake, I immediately knew I wanted to bake it for Bethel and Evan to deliver it to them on Valentine’s Day as a little piece of nostalgia :) I have searched for recipes online and can’t seem to find what I’m looking for. So, how could I say no? First to such a sweet girl, second to such a loving couple (not to mention this cute lady who no longer has her recipes. I can’t imagine losing all my recipes! ), and third to this cake that sounded unbelievably delicious. Allee, here are the results of what I’ve come up with. I hope it’s close! This elegant cake is simply divine. 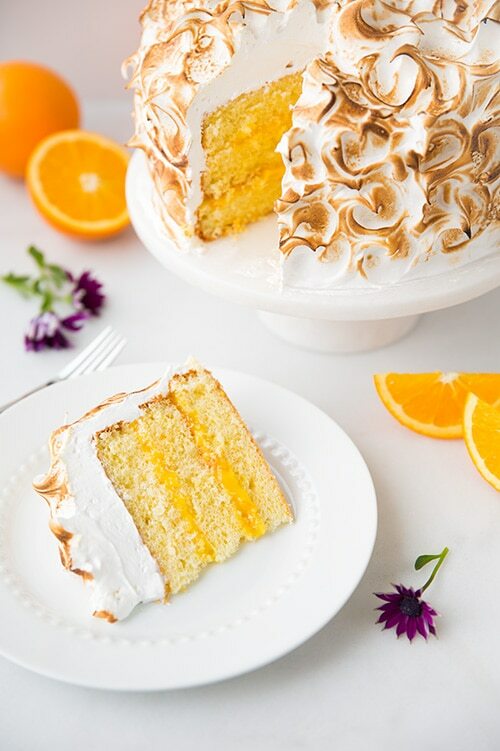 It’s made up of three soft and fluffy layers of orange chiffon cake, which is given its bright, vibrant orange flavor from both plenty of fresh orange juice and fresh orange zest. 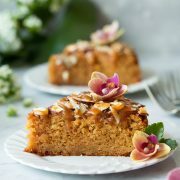 Then, it is layered with a creamy, zesty orange filling that is very similar to a curd but not quite as tart and thick. 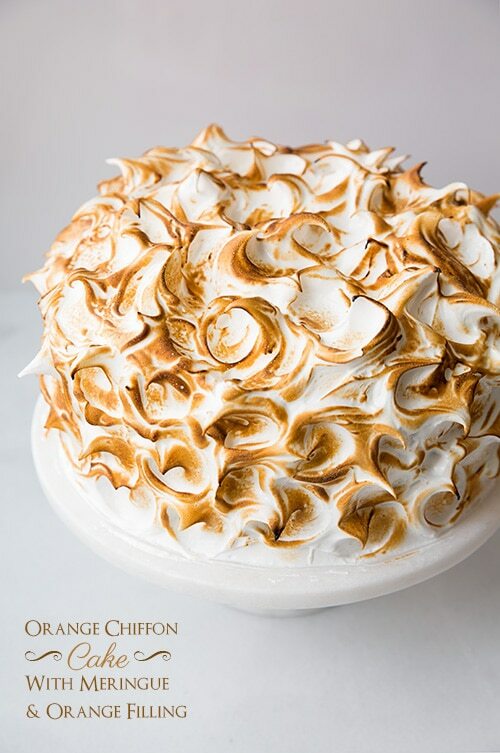 Lastly it’s finished off with a delicate, sweet meringue that’s whipped into those lovely peaks and swirled over the entire cake and toasted to golden brown perfection. This is a cake not to be forgotten! 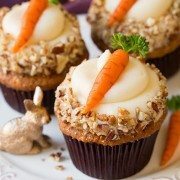 Make the orange filling first. To do so, simply heat the orange juice and zest, lemon juice, cornstarch, salt, and sugar in a saucepan before stirring in the egg yolks and whole egg. Finally, add the butter to the hot mixture and let that set in the fridge for a few hours. Make the cake next. This orange chiffon cake batter is fairly straightforward to make, but you’ll need to fold whipped egg whites into the batter before baking it. (Otherwise, this is a totally normal cake!). Bake the orange chiffon cake layers 17 – 19 minutes, or until a toothpick inserted in the middle comes out clean. Make the homemade meringue frosting. If you’ve never learned how to make meringue, don’t worry! It’s super easy. Simple heat egg whites and sugar in a heat-proof bowl over boiling water. Then beat with cream of tartar until stiff peaks form. Assemble the cake. When you spread the meringue frosting onto the cake, don’t try to smooth it out. The peaks give the toasted meringue the most incredible texture. Can I Use Store-Bought Orange Curd in This Cake? Yes, although the flavor of this orange chiffon cake won’t be quite right. Orange curd is slightly thicker and more tart than the orange filling used in this orange cake recipe, but store-bought will work if you’re in a real time crunch. This layer cake should be served immediately or stored covered in the fridge. When you’re ready to serve this cake, let it first come to room temperature before slicing it. If you don’t want to do all the work in one day (because it is a slightly lengthy recipe), what I did was make the cake portion and orange filling the night before (be sure to cover the cake in an airtight container so it doesn’t dry), then I made the meringue and assembled it the next day. 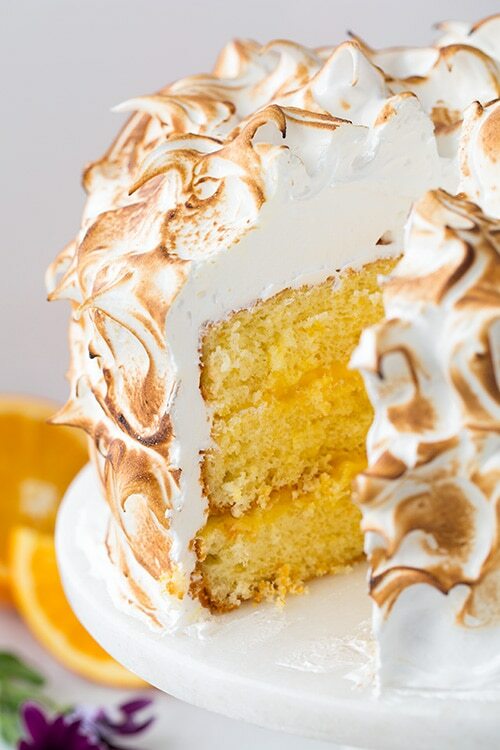 Be careful not to let a single drop of egg yolk into the meringue. If any egg yolk sneaks into the egg whites, the meringue frosting won’t whip up properly. Make sure to temper the egg mixture before adding it to the hot orange filling, otherwise the eggs will scramble. I’ve explained exactly how to do this in the instructions below. Congratulations Bethel and Evan to both a long, prosperous life and marriage! This three-layer Orange Chiffon Cake is layered with a creamy, zesty orange filling. and is finished off with a delicate toasted meringue frosting. For the orange filling: In a medium saucepan, whisk together sugar, cornstarch and salt. Stir in orange zest, orange juice, and lemon juice. Bring mixture to a boil over medium heat, stirring frequently, and allow to boil about 1 minute (mixture should thicken slightly and become translucent). Meanwhile, in a bowl, whisk together egg yolks and egg until very well blended. While mixing egg mixture, slowly pour 1/4 cup of the hot orange juice mixture over eggs and stir until well blended. Remove saucepan from heat (once it's boiled as listed above) and while stirring mixture in saucepan, slowly pour egg mixture into saucepan. Reduce burner temperature to medium-low heat and return saucepan to burner and cook, stirring constantly (and whisking rather vigorously to prevent curdling) until mixture thickens well, about 4 minutes. Remove from heat, add butter and stir until combined. Pour into a bowl, cover with plastic wrap pressing directly against surface of filling, and chill 2 hours. For the cake: Preheat oven to 350 degrees F. Butter and flour three 9-inch round cake pans (lightly butter sides), set aside. To the bowl of an electric stand mixer fitted with the paddle attachment (or using a bowl and electric hand mixer), add 1 1/3 cups granulated sugar, baking powder, salt and sift cake flour into bowl. Pour in canola oil, egg yolks (while reserving the whites in a separate mixing bowl) and orange juice. Blend mixture on medium-high speed until smooth, about 3 - 4 minutes (slightly less if using a paddle attachment that has the scraper), occasionally scraping down sides and bottom of bowl. Blend in orange zest and vanilla extract. In a large mixing bowl, using an electric hand mixer (or if you have two stand mixer bowls you can use your stand mixer with the whisk attachment), whip 5 reserved egg whites with 1/2 tsp cream of tartar on moderately high speed until stiff (but not dry) peaks form. Add half of the whipped egg whites to the batter and fold until partially combined, then add remaining half of the whipped egg whites and fold just until combined (be careful not to overfold and deflate the eggs). 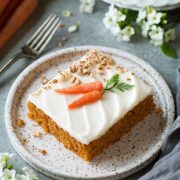 Divide batter evenly among prepared baking pans and bake in preheated oven 17 - 19 minutes until toothpick inserted into center of cake comes out clean. Allow to cool in cake pans 10 minutes, then invert onto wire racks to cool completely before frosting with meringue. For the meringue: Add 6 egg whites (don't allow one drop of egg yolk) and sugar to a very clean heatproof bowl and set over a saucepan of barely simmering water. Heat mixture, stirring constantly, until it registers 160 degrees on a candy thermometer, about 3 - 5 minutes. Remove bowl from saucepan, add 1/4 tsp cream of tartar and beat mixture with an electric stand mixer on medium-high speed until stiff glossy peaks form, about 7 - 9 minutes (possibly longer in a humid environment). To assemble cake: Trim tops of each cake off to form an even layer. Spread half of the chilled orange filling over 1 layer of the cake (crumb/top side up, drop in a large dollop and spread outward so it doesn't get all crumby), leaving about a 1/2-inch rim of cake uncoated (because once the other layers are added the weight will slightly push the filling outward). Top with another layer of the cake (crumb/top side up), followed by remaining half of the orange filling, leaving a 1/2-inch rim of cake uncoated. Top with last layer (crumb/top side down) and spread meringue over entire cake. Toast meringue with a culinary torch until golden brown (and keeping a close eye making sure to blow any little flame out). 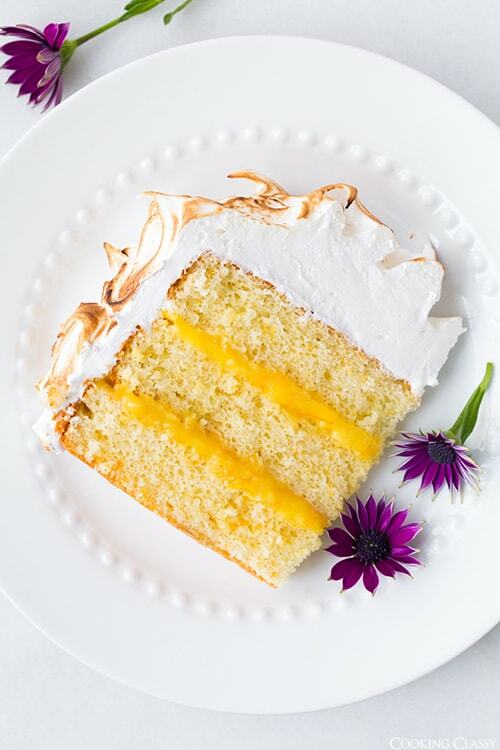 Recipe Source: Filling is from Cooking Classy, chiffon cake is adapted with slight changes from Southern Living, and the meringue is adapted from many different sources I've learned how to make meringue from, ratios are my own. Serve cake immediately or store covered in refrigerator and bring to room temperature before enjoying. charmainec: Hi.if i make the orange filling and than i cover the cake with fondunt,how many days I can leave it pls? Christelle: I’ve tried a copycat of your recipe and it was fabulous ! 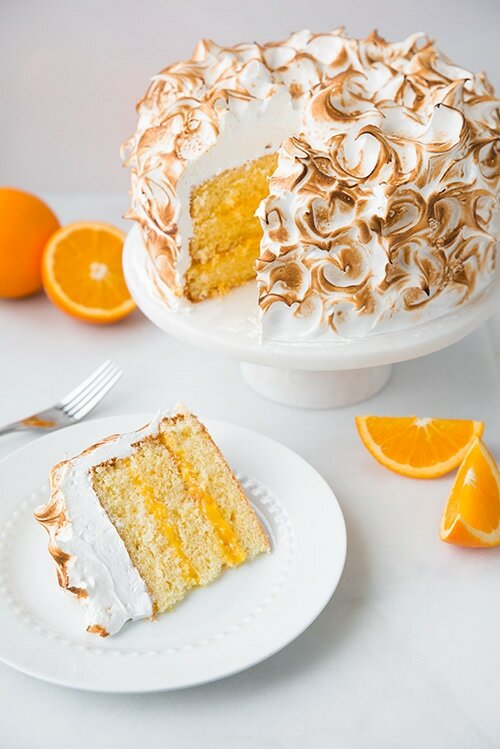 I’m not really fond of meringue and citrus fruit but i really enjoyed the result!